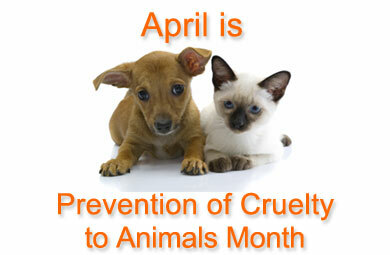 This month we are happy to celebrate the prevention of animal cruelty. According to MSPCA.org, cruelty to animals is the infliction of physical pain, suffering or death upon an animal, when not necessary for purposes of training or discipline or (in the case of death) to procure food or to release the animal from incurable suffering, but done wantonly, for mere sport, for the indulgence of a cruel and vindictive temper, or with reckless indifference to its pain. According to the American Horse Council, Americans own more than 9 million horses, up from more than 6 million in the mid-1990s. Backyard breeding fueled the boom in pet horses. Of the more than 2 million Americans who own horses, more than one-third have a household income of less than $50,000. Neither the total number of horse neglect cases nor the percentage of total animal abuse cases classified as horse neglect has risen since the closure of all U.S. horse slaughter plants. As Humane Society of the United States investigations into slaughterhouses and cattle auctions have revealed, animal abuse abounds in the factory farm industry. Despite increased feed prices, they found no indication in the news media that the number of livestock neglect cases is increasing, other than a few shocking, high-profile cases. This may, however, simply be a reflection of the weak protections afforded to livestock under state animal cruelty laws. If you are looking for a furry companion, please consider adopting from your local animal shelter or community rescue organization. If you need help to get started, PetFinder.com is an excellent place to look for homeless pets. In addition, you can check out our list of Don’t Be Cruel partners who have wonderful pets in need. If you can’t adopt, foster. Many animals are in need of temporary homes while finding a forever family. Ask your local shelter if they need help. Remember, many places not only need people to physically take care of the shelter or animals but need people with certain skill sets like fundraising, marketing, public relations, etc. The more the public knows about adoptable pets, the better the chances are of finding them a home. Shelters and rescue organizations depend on you to keep their mission going. Most of these places solely depend on donations. If you can’t donate money, please consider other types of donations like towels, blankets, food, toys, etc. Check a shelter’s website for a wish list or call ask about about it. Many rescue organizations have farm animals that depend on monthly sponsors. If you are interested in helping large animals, consider sponsoring one. Rescues like Shiloh’s Horse Rescue in Nevada and For the Animals Sanctuary in New Jersey have wonderful animals in need of your help. The prevention month is officially through the ASPCA and they wear orange to show their unwavering decision on the matter. Encourage your friends to spread the word about the month-long ‘Go Orange’ campaign! Lastly, we want to remind you that for every purchase you make at our Don’t Be Cruel store, proceeds will go to local shelters and rescues. We are proud to say that in the past two years, we donated over $8,500. This entry was posted in Animals Around the World and tagged Animal Cruelty Prevention month, ASPCA, For the Animals Sanctuary, Go Orange Campaign, HSUS, Humane Society of the United States, MSPCA, Pet-Abuse.com, Shiloh's Horse Rescue on April 18, 2013 by Belkis Cardona-Rivera.